This spacious private home in the Beechwood area of Loon Mountain is a perfect location for your mountain retreat. Enter to a foyer with bench to remove your shoes and a closet for your outdoor gear. Through the foyer is the main living area with flat screen TV, comfortable seating and air conditioning. Sliding glass doors from the living area open to the wrap-around deck with wooded view. The living room opens to the dining room and kitchen. The large kitchen has plentiful counter and cabinet space. The dining room seats six with three additional seats available at the kitchen counter. Off the kitchen is a hallway leading to the den and 1/2 bath. Past the dining area and upstairs you will find the master bedroom suite with queen bed, air conditioning, small deck and private bath. From the living area head downstairs to a second cozy living area with a couch, air conditioning and smaller flat-screen television. Off this living area are two bedrooms with a shared full bath and laundry room between them. One bedroom has a queen bed. The second bedroom has two queen beds. Fabulous ski vacation. Accommodations were fantastic, the ony prob was there were 2 tvs that were not working. Super psyched to see all the tvs but only the main one work. Oh well, we weren't there to watch tv. The loon reservation staff is the best. Every question answered and every concern taken care of. They are truly the best!! a guest from Haverhill, MA does not recommend this vacation rental. This house is dated but clean. Pricey for all the issues. Vacuum clogged; no refill bags. No offer to provide replacement vacuum. Had to change several light bulbs. Washer didn’t spin clothes thoroughly. Dryer hose disconnected. Repaired and still didn’t work! No grill. Very poor water pressure. No deck furniture! Slider lock broken. I did like that I could bring my dog!!! Thank you for your comments. The owner has since sent up a set of new vacuum cleaner bags, the washer pressure issue has been corrected by a plumber, the dryer hose has been repaired, there is now deck furniture, the deck slider lock has been corrected and the whole area has had some landscaping done. Many more small items have been updated since your stay, and we'd love to have you visit again. My wife and I stayed in this house from 5/24 - 6/3 and we loved it. It was spotless upon arrival and Loon Reservation Service did a great job managing the stay. We find this house very interesting and had tons of room. Also it is on the end of a loop road so it is quiet even when there is a lot of folks around! The house was great. Its the Loon Reservation I was disappointed in. They give give you a list of what needs to be done when leaving. Starting the dish washer with dirty dishes and DRIVING down to the recycle center to get rid of your trash. If your going to make me do cleaning and DRIVING down to the dump center then why am I being charged for all these fee's including cleaning. I shouldn't have to go out of my way to get rid of trash. I understand it's because there is no dumpster on premise, but make the cleaning people drive it down. I pay to not have to deal with that. Beautiful home that needs upgrades to give renters what they are paying for. New insulated Garage doors, new toilets, master bedroom shower door that opens from both ends, living room sliding glass doors that actually lock, plus many other upgrades. Family of 5 plus 2 dogs ... we stayed in this home over Colombus day weekend, which is peak foliage and very crowded but this Home was a quiet, comfortable sanctuary. There was plenty of room for all of us. The dogs loved the wrap around deck and we all appreciated the awesome gas fireplace. The house is a bit older than others in the neighborhood but well designed with plenty of parking (2 in the garage, 2 out). No real yard to speak of but plenty of trails nearby. I was concerned that the basement (2 bedrooms and a den) smelled musty so I called Loon Reservations ana they came up right away and turned on wall unit dehumidifier which cleared the air in no time. The very light cream colored carpet upstairs and downstairs was a concern (2 dogs rainy weekend) so we kept the downstairs door closed and blocked off the steps leading to the master BR and the dogs stayed on the main floor (wood and tile) Very nice visit, look forward to next year. a guest from Quincy, MA does not recommend this vacation rental. The location of this property is great, very close to Loon. The house was very clean, and the furniture looked nice. Two of the three bedrooms were located in the basement. The mattresses were not comfortable and I ended up having to sleep on the couch for four nights. 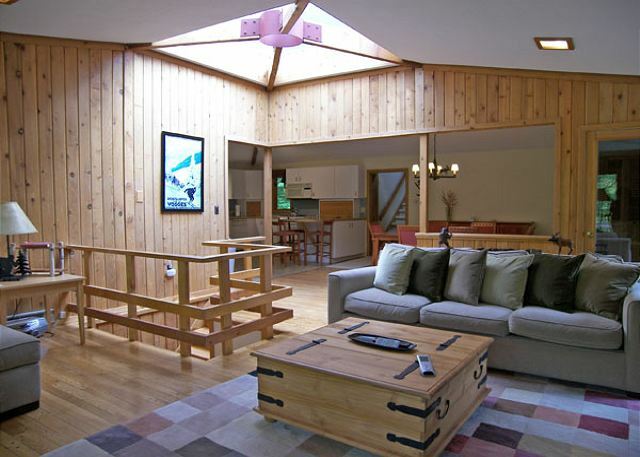 The home is beautiful- perfect for a group weekend- right on the mountain! We stayed in to cook a meal, as the kitchen is fully stocked. Dog friendly- my Nelson loved relaxing by the fire! Thank you for a great time! We'd love to stay again. Awesome. The place had everything we needed and more. Very pet friendly! We arrived to the property and found it clean, bright, convenient, and spacious. The kitchen is well-appointed and open - easy to cook/entertain. We stayed five days and thoroughly enjoyed our time. We were four adults and one child and everyone had space to read, relax, and play. We would highly recommend this vacation home to a large family or even a group looking to have a getaway. Even though there are three bedrooms, there is plenty of space to sleep 8+. We had excellent service, as it snowed a good deal and the driveway was cleaned quickly as were the steps and entrance. We found going in and out of the garage to be most convenient. The house has a great layout. We highly recommend this rental. A group of 6 stayed for a long weekend. There was plenty of sleeping space and the beds were very comfortable! The pillows in the master bedroom were wonderful. The house had alot more space than I thought based on pictures and we loved it. It is close enough to the mountain that we were able to walk down to the spa. We will definitely rent again! The only thing I can say that might need improvement is that when I first walked in there was a very strong odor of cleanser; it seemed to be from the couch/carpet cleaner but I opened some windows and it quickly went away. It wasn't unpleasant or bad, just there. Loon Reservation Service was easy to work with and were very flexible. Cleaning up and leaving was simple. The office was open on Sunday so I was able to just drop off the keys. A great experience! We had a lovely time at Loon and enjoyed our stay at Beechnut 5. The house was generally very well appointed, but we were two families of four, and would have much preferred two sets of bunk beds in 3rd bedroom as opposed to two queen beds. We made it work, however, and enjoyed our stay. Glad to see that you had a lovely time. We do explain the bedding on our site, in conversations and in the rental documents. Glad you made it work.